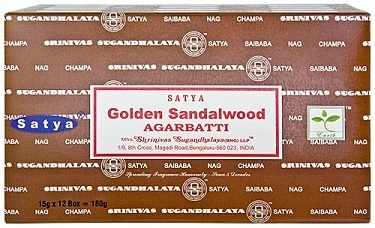 From Satya Sai Baba, the makers of the famous Nag Champa comes a wonderful fragrance - the pure, woodsy scent of Golden Sandalwood. Use to create a wonderful sense of relaxation, in aromatherapy or simply as a delightful way to freshen a room. Hand rolled in India from pure extracts and fine scented oils, Satya Sai Baba Incense is world renown for fine fragrance.